Our house is available for letting all year round. 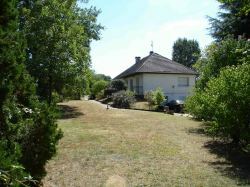 It is very secluded and set in extremely peaceful countryside. 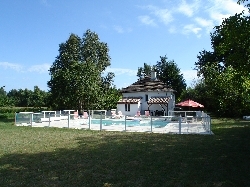 It is an ideal place for rediscovering peace, relaxation and good living; it can accommodate 8-10 people and has a (10x5m) swimming pool. 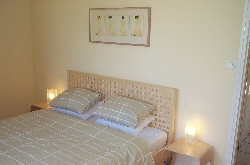 The recently renovated house is comfortably furnished and consists of a double bedroom with king size bed, a twin bedded room and a bathroom on the upper floor. There is also a double sofa bed available for use. 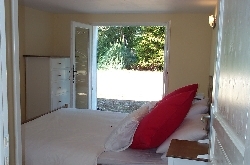 On the lower floor there is another double bedroom with king size bed and a twin bedded room. There is also a second shower room. The house is double glazed throughout. The open-plan living room comprises a sitting area with two large sofas with a fire place in the corner. There is a TV(+Sky), DVD, Sony Playstation2, radio and music centre. The dining room has a large table, which can seat ten people. A highchair is also available for use. 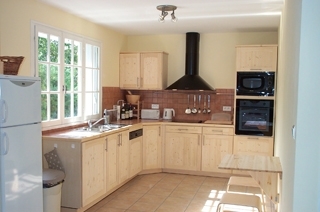 There is an extremely well-equipped kitchen with dishwasher, fridge/freezer, microwave, halogen/ceramic hob and electric oven. French doors lead out from the lounge onto the front terrace with flower beds and trees in abundance. A path leads down to the pool and terrace area which has a built-in BBQ adjacent. 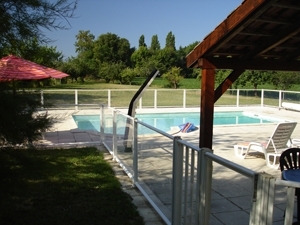 The fully enclosed pool leads onto the grass lawn which is lined by a variety of fruit trees. 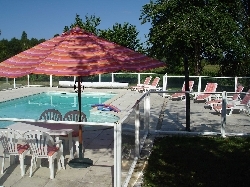 Garden furniture is provided in this area with parasols and a pergola to provide shade. The house basement has a utility area at the rear with a washing machine and tumble dryer. 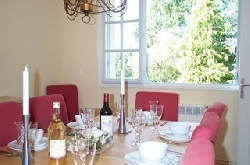 The house is available throughout the year and is generally let from Sunday to Sunday. The price includes bed linen, towels, electricity and water. No pets are permitted. 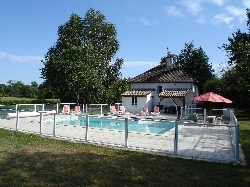 The house is well situated for visiting the sights and delights of both the Dordogne and Lot regions of SW France, being halfway between the two rivers.